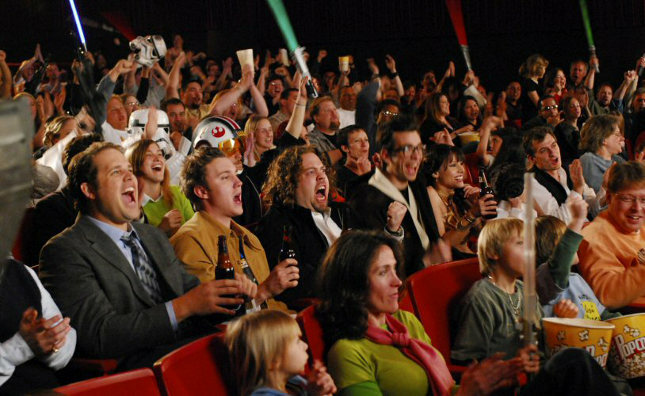 The Fanboys eagerly await the opening of Star Wars Episode I: The Phantom Menace. Remember when, back in 1999, the Star Wars hype was almost as huge, if not even bigger, than this year? After an absence of more than a decade and a half, the saga was about to return with Episode I: The Phantom Menace, and expectations were through the roof. Fanboys, a 2009 comedy by director Kyle Newman, feeds to the frenzy of that time. As the title suggests, you might be in for a wild ride if you belong to the eponymous group. Does the film satisfy in that regard, however, and – on top of that – is it also a movie that’s fun to watch for non-Fanboys? 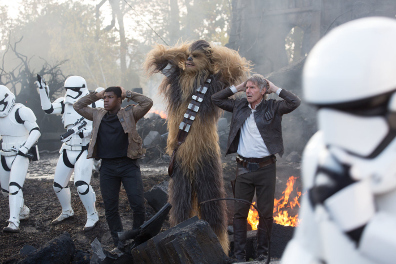 Finn (John Boyega), Chewbacca (Peter Mayhew), and Han Solo (Harrison Ford, from left to right) are in the hands of the Stormtroopers once again. ‘Once upon a time, in a galaxy far, far away…’ Every part of the Star Wars franchise begins with that fairy tale opening and John Williams’s trademark fanfare, and each time, the diehard fans have been passionate about it. A decade after George Lucas’s final film in the series, the latest installment, Episode VII: The Force Awakens, has smashed all previous box-office records with J.J. Abrams, Hollywood’s current favorite wunderkind to be handed over the reins for classic franchises, at the controls for the first time.